Distinguished Scholarly Book Award (2014), American Sociological Association. Contemporary Sociology, Symposium (Volume 42, 2013): "Inheritance of Poverty or Inheritance of Place? The Emerging Consensus on Neighborhoods and Stratification," by Douglas S. Massey, and "Chicago as Seen by the Chicago School’s Greatest Practitioner," by Lincoln Quillian (pp. 690-699). American Sociological Association, click here. C ity & Community: “Symposium on Robert J. Sampson's Great American City: Chicago and the Enduring Neighborhood Effect” (March 2013, 12:1-31). Featuring essays by Nancy Denton, Claude Fischer, John Goering, John Hagan and Wenona Richmond-Ryder, and Robert J. Sampson. Bursik, Robert J. Jr. 2013. Book Review, Theoretical Criminology 17: 428-30. Timberlake, Jeff. 2013. Book Review, Journal of Urban Affairs 35: 385–92. Reifer, Thomas E. 2013. “Review Essay: The Reassertion of Race, Space, and Punishment’s Place in Urban Sociology and Critical Criminology.” Environment and Planning D: Society and Space 31: 372-380. Ludwig, Jens. 2013. 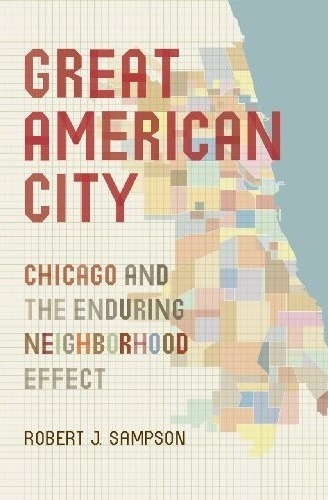 Book Review, Great American City: Chicago and the Enduring Neighborhood Effect by Robert J. Sampson.. American Journal of Sociology Vol. 118, No. 5 (March 2013), pp. 1447-1449. Massey, Douglas S. 2012. "Location Matters" in Science 36: 35-36. "Neighborhood as a Social Fact: Lessons from the Case of Chicago." Review by Roberta Gardner for Books and Ideas (September 2012). Podcast interview with the New York Times, "Hanging On in Chicago," January 8, 2013. Associated with a story about a neighborhood in Chicago under challenge: “Diagnosis: Battered but Vibrant.” See also "Saving Chatham"and "Chatham's Community Character." Chicago Ideas Week lecture on video: "Neighborhood Effects and the Contemporary City," October 9th, 2012. “NORC 70th Anniversary Celebration Keynote Address"
Sampson, Robert J. and John H. Laub. 1995. Crime in the Making: Pathways and Turning Points through Life. Cambridge, MA: Harvard University Press. Laub, John H. and Robert J. Sampson. 2006. Shared Beginnings: Delinquent Boys to Age 70. Cambridge, MA: Harvard University Press. Wikström, Per-Olof and Robert J. Sampson (Editors). 2006. The Explanation of Crime: Context, Mechanisms and Development. Cambridge, UK: Cambridge University Press. Byrne, J.M. and Robert J. Sampson (Editors). 1986. The Social Ecology of Crime. New York, NY: Springer-Verlag Press. Farrington, David P., Robert J. Sampson, and Per-Olof H.Wikström (Editors). 1993. Integrating Individual and Ecological Aspects of Crime. National Council for Crime Prevention Sweden. McDonald, John and Robert J. Sampson (Editors). 2012. Immigration and the Changing Social Fabric of American Cities. ANNALS of the American Academy of Political and Social Science, Volume 641 (May). Thousand Oaks, CA: Sage Publications. See also: "Don't Shut the Golden Door: The Beneficial Impact of Immigration." New York Times, June 2012. Massey, Douglas S. and Robert J. Sampson (Editors). 2009. The Moynihan Report Revisited: Lessons and Reflections afer Four Decades. ANNALS of the American Academy of Political and Social Science, Volume 621 (January). Thousand Oaks, CA: Sage Publications. Sampson, Robert J. and John H Laub (Editors). 2005. Developmental Criminology and Its Discontents: Trajectories of Crime from Childhood to Old Age. ANNALS of the American Academy of Political and Social Science. Volume 602, November. Thousand Oaks, CA: Sage Publications.